The most idyllic place on earth, laced throughout with unimaginable luxuries and Maldivian beauty, Centara Grand Island Resort & Spa is a timeless retreat that oozes sophistication and elegance for its lucky guests. 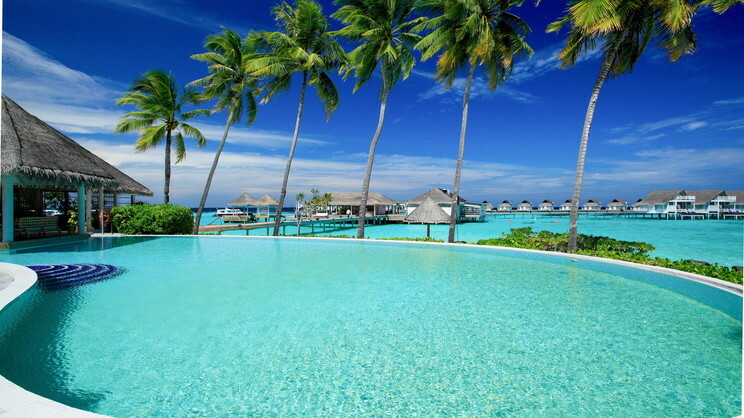 Holidays to the Maldives evoke feelings harmony, relaxation and sheer aquatic beauty. Centara Island offers all that and more. 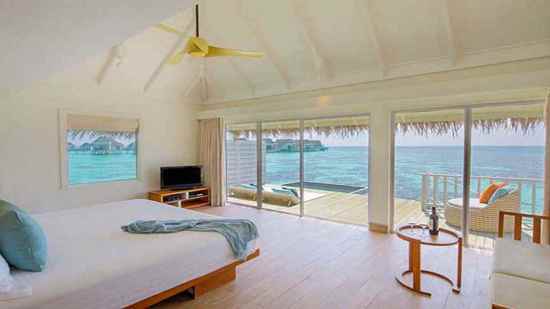 Indulge in private and spacious water bungalows set on stilts over the lagoon, or family beach villas with separate bedrooms and living areas plus stunning private pools. Stroll along the boardwalk to find a quiet spot for lunch either on the beach or in one of the high-class restaurants. Spend the day exploring land and sea via dhoni cruises and scuba diving the colourful marine world. There’s a host of water sports for families of all ages and there’s a wealth of privileges to accommodate. Malé is the neighbouring island and capital of Maldives filled with history and heritage. 25 minutes’ air transfer from Malé International Airport or 15 minutes’ speedboat transfer from the domestic Maamigili Airport. Relax in a modern and inviting suite filled with elegant provisions and featuring direct access to the stunning white sand beach. 87 square metres offers a separate lounge area plus a king bedroom and private bathroom on the mezzanine level. This beautiful suite can easily accommodate up to 3 adults or 2 adults and 2 children. Wake up to beguiling views of a turquoise lagoon from your private sundeck. Located on the northern side of the island, here is where the endless horizon meets pure blue sea and pristine accommodation that just oozes that wow factor. Access to standard amenities applies and the spacious 86 square metres comfortably accommodates 3 adults / 2 adults and 1 child. Perfect for families with younger ones, these luxurious water villas are equipped with extras such as a separate children’s sleeping area with bunkbeds. Additional amenities such as PlayStation video games, in-room movies and secured terrace access ensure safety and comfort. 93 square metres of space features a stunning interior design with a king-bedroom and expansive bathroom with shower and tub. Guests can also enjoy unobstructed ocean views from the expansive terrace and steps leading to the lagoon. 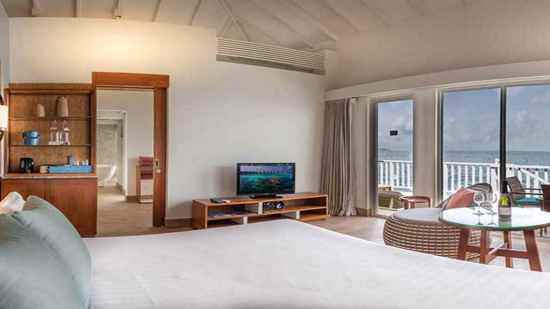 Fabulously exotic and equipped for an exclusive stay, this special Ocean Water Villa is poised to enjoy captivating views of the Indian Ocean from the western edge of the island. An expansive terrace is the key to luxury outdoor living and can be access from the master bedroom where morning views of the most fabulous scenes set the day off in style. Step directly down to the lagoon from the sea-gazing bedroom, relax in 110 square metres of living space, and enjoy a private dinner under the stars cooked to perfection by the resort chefs. This is luxury living at its finest. 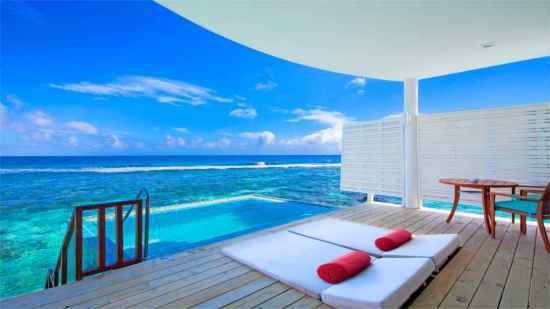 Some of the most elegant accommodation in Centara Grand Island Resort is the Luxury Beachfront Pool Villas. Designed to offer 1- or 2-bed configurations, the villas feature private plunge pools, expansive terraces, and mezzanine levels ensuring the king bedroom and master bath remains private from the living quarters. 159 square metres of living space can accommodate couples and honeymooners in the one-bed option whilst families with up to 3 children can be accommodated in the two-bed villas that feature an extra bathroom on the ground floor. The most opulent of spaces, this luxury accommodation encases all that is the Centara resort brand. 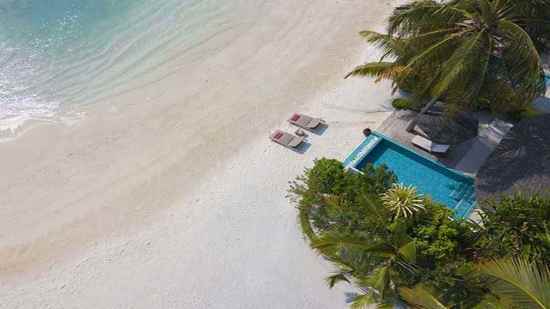 Enhancing a fabulous trip to the Maldives is a stay in this the Sunset Ocean Pool Villa. The private 12-square metre plunge pool is situated on the expansive private terrace facing the ocean. The bedroom open out on to the terrace and is poised for fantastic ocean views. There are club benefits in addition, where exclusive dining options are offered. Allow yourself and the family, a maximum of 2 adults and 1 child, a truly decadent experience here at Centara Grand Island Resort. Continuing the theme of luxury and first-class experiences, dining at Centara Grand Island resort is something to behold! Open your senses to a feast of delights from delicate seafood to flavourful Maldivian classics. Grab a light lunch, pizzas with the children or sweet treats by the pool. The world of options is right here in-resort. Enjoy richly decadent champagne breakfasts overlooking the pool in this contemporary thatched roof venue. Breakfast, lunch and dinner feature Western and Asian influences served from live cooking stations. Vegetarian options are also available. Much-loved Italian and fresh catch of the day combine well with an array of fresh seafood delights all served here in a romantic setting. Views across the lagoon are perfect for adding atmosphere to the family meal or for a romantic couples’ dinner. Enjoy Thai delicacies here next to the lotus pond where indoor and alfresco seating is offered. Again, vegetarian dishes are available as in keeping with classic Thai cuisine. Enjoy a host of light refreshments and snacks along with cool cocktails at this stylish venue. Nutritional lunches, five-course dinners, and private candle-lit dinners can be enjoyed along with premium beverages and tea and coffee here at the exclusive Club Lounge. Details may be subject to change. You will be provided with full details of The Club privileges on arrival at the hotel.